Interesting. I’ve never heard of the author before but will explore it further. Of course the WWII element has a special appeal but alos what you write about the increase in interest in the first last 1/3 of the novel. Sounds like quite a twist. It took me completely by surprise. I’m a fan of Balchin. If you have The Small Back Room on your shelf, it might be time to take it down. The Fall of the Sparrow is also a good read and gives an interesting glimpse into how gay men were seen in the 1950s, among many other things. I have The Small Back Room, The Way Through the Wood (Separate Lies) and Darkness Falls from the Air. I’ve seen the film versions of the first two, but I don’t own the Fall of the Sparrow. I’ll correct that. Thanks for the tip as if you say you like these, there’s a good chance I will also. Of course I’ve never heard of him. It sounds interesting and I’m glad you’ve discover a “new” writer and I’m intrigued by the last third. I see all the books available are used copies. Very interesting Guy. He’s a new name to me as well. I see the website you link to describes his as “an industrial psychologist”…a vaguely sinister title. I’m attracted by the apparent similarity to Highsmith as well. I left you a message on Caroline’s blog the other day but I’m not sure you’ve seen it. Je tente ma chance ici. If you want to write reviews of the books you read for the German Lit Month, I can publish them as guest posts on my blog. Let me know if you’re tempted. The language is a bit stiffer than Highsmith, but there are certainly similarities. I read on the website that he was the driving force behind the Black Magic ads. (The man stealing into the bedroom and leaving the box of chocs). Hi Emma, sorry, I hadn’t seen that. Thanks for the offer, I’d love to try that. OK, e-mail me and we’ll arrange the details. I saw that about the Black Magic. Apparently he also named the Kit Kat bar. I can’t say that I ever wondered who was behind the Black Magic ads, but they’re certainly memorable. When you talked of how the first 2/3 were decent I expected you to say the final 1/3 went markedly downhill. Instead it’s a rare example of a book that suddenly improves. How very rare. Is it still in print? I’ll certainly check out the website link. I’d never heard of Baluchin before, an interesting find. Over here, the book isn’t in print. Separate Lies (A Way Through The Wood) was rereleased a couple of years back due to the film. The last time I checked, A Small Back Room and Darkness Falls through the Air were both in print. Thanks for an interesting piece. As Balchin’s biographer (I’m about a third of the way through writing the book) and the author of the website you kindly namecheck (www.nigelmarlinbalchin.co.uk) perhaps I can be permitted to make a few comments? 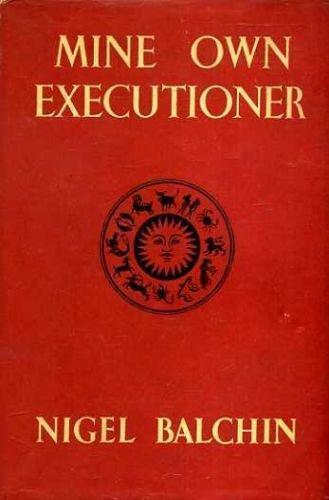 I would say that Mine Own Executioner is a book of three thirds. Although I enjoyed the first third the first few times I read it, I struggle with it when rereading the book nowadays. There’s too much “establishing” going on, too much chat, too much 1940s slang and the relationship between Felix and Patricia always makes me feel distinctly nauseous (modern-day sensibilities probably!). The second third is where the book really gets going for me, particularly when Adam Lucian enters the story. This is the part of the book where we learn what happened to Adam during the War (the description of his capture by, and subsequent escape from, the Japanese is one of the most gripping things Balchin ever wrote). Of course in the third (and final) part of the book Balchin enters thriller territory (something he was very good at) and this is why the book changes both style and pace at this point. Incidentally, it may be of interest to note that Balchin didn’t rate this novel at all. He felt it was written with too little first-hand knowledge of the subject (unlike most of his novels). When he finished the manuscript he was so disgusted with it that he tried to tear it up, failed, and threw the pages in the air in frustration! I think he felt that he’d come up with a good idea for a novel but muffed its execution. The film is impressive but very hard to get to see these days (at least in the UK). My copy is a VHS one imported from the USA via eBay. I believe that the film is still shown occasionally on American TV. Those who enjoy this novel should also try Darkness Falls From the Air, The Small Back Room and The Fall of the Sparrow, all of which I rate more highly than Mine Own Executioner. Others worth reading are Sundry Creditors, A Sort of Traitors, Seen Dimly Before Dawn and A Way Through the Wood. With the exception of the last named (which was renamed Separate Lies following movie adaptation) all of Balchin’s novels are out of print in the UK. Copies of all the above books should however be easy to find on the Internet (i.e. http://www.abebooks.co.uk) and in secondhand bookshops. By the way, I hope my website doesn’t claim that Balchin wrote the advertising copy for Black Magic! If it does, then that’s my mistake. He was a consultant on advertising strategy but didn’t write any copy (at least not to my knowledge). His two key roles on Black Magic were performing the initial market research for it and designing the distinctive black box. Thanks for the long and informative comment. I leapt to the conclusion that Balchin had something to do with the ads–all that cloak and dagger stuff. If you are interested in a DVD version and have an all region player, then http://www.moviesunlimited.com has this film on DVD. They are an excellent company and very easy to deal with. A bio on Balchin sounds like the sort of thing I’d be interested in reading. I found some of the language a bit old-fashioned but it was the 40s so I was willing to overlook it. In my film review (link elsewhere in the comments), I made some points about Felix struggling against the establishment in his efforts for professional recognition, and I also drew some parallels and contrasts between Felix and Lucian’s relationships with their wives. I intend to get back to Balchin very soon–Separate Lies is next. I don’t know of Balchin ever writing any copy for Black Magic (although it’s possible that he may have done so). He was a consultant on marketing campaigns and general advertising strategy from about 1938 until 1955 but the only copy that I know he wrote for sure was some for Horlicks in 1951. I enjoyed your piece elsewhere about the film of Mine Own Executioner. I will try to get a DVD copy as suggested because my old VHS one is pretty beaten up and difficult to watch. Thanks Derek: An excellent film–even though it’s different from the book in some ways.